Ready to get down to business on twitter and start pulling in more traffic, and leads? 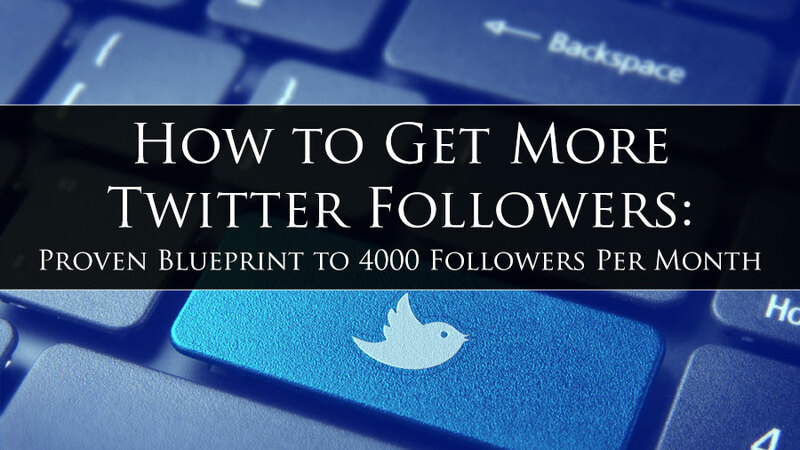 We're about to show you how to get more twitter followers using a simple and proven blueprint. We'll also be using some of our MLSP members as a case study showing you just what's possible when using this framework! 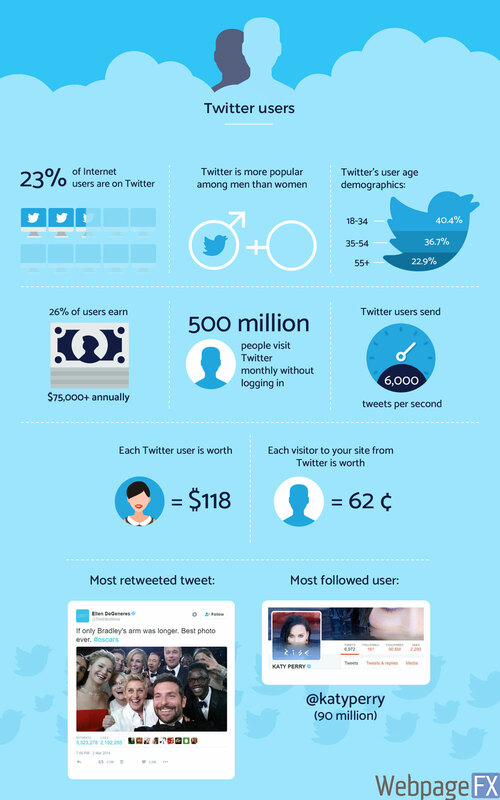 Twitter is a bit of a hidden treasure for marketers. There's much more than meets the eye with this micro-blogging social network. Many marketers avoid Twitter, and focus most of their efforts on Facebook and Instagram. Yet some savvy marketers who are in-the-know are using Twitter every single day to build a massive audience, get traffic to their sites, rake in 30+ leads every single day…and even rank videos. It all starts with the first step though. Getting followers and building your audience. And that's what this article will focus on – how to get more twitter followers! While Facebook and Instagram grab a lot of the spotlight, Twitter and it's 140 characters are one of the most effective ways get free leads and traffic. While Facebook Marketing and Instagram are a great way to generate leads as well, Twitter is always there waiting for you to take advantage. When you use the right tools, Twitter can be highly automated, and therefore becomes a more hands free approach to grow you business. Who wouldn’t want automated traffic and highly targeted leads without paid ads? Some Quick Twitter Stats That Connot Be Ignored! Ignore this marketing platform at your own risk. However, if you're ready to dive into this growing pool of potential prospects to build ANY business, in any niche, then let's get started! You scratch my back I'll scratch yours. Twitter runs on the unspoken rule of reciprocity. Meaning when you follow someone on Twitter, it's customary for them to follow you back. The same goes for Likes, and Retweets! Which means it's quite simple to quickly build an audience of like-minded people… who want (and need) what you have to offer. Know Where Your Audience is Hanging Out to Get Twitter Leads for FREE! The first step in attraction marketing (or any marketing for that matter) is to know where to find your target audience. Who is Your Target Audience Following? Ray Higdon has over 65K followers on Twitter. Because all of these are leaders in the network marketing industry, and they're sitting on a pool of prospects that they have already done the work to get. Thanks guys and gals! Not in network marketing? There are leaders and companies with massive Twitter followings in your niche as well. Guaranteed. 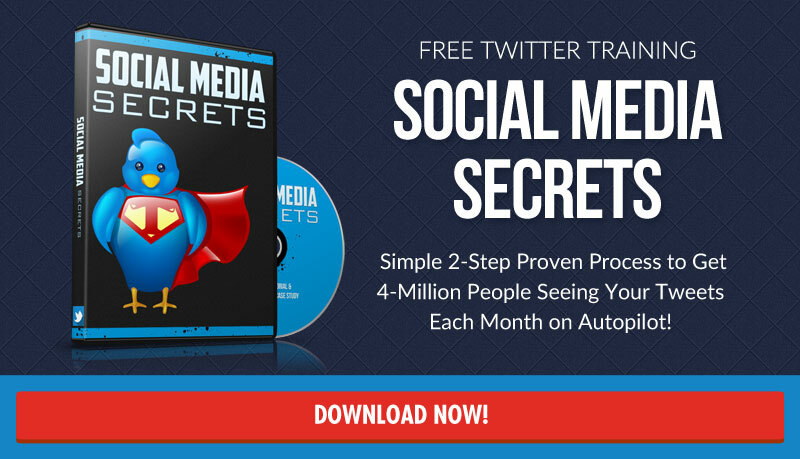 FREE TWITTER TUTORIAL: Simple 2-Step Proven Process to Get 4-Million People Seeing Your Tweets Each Month on Autopilot! It’s so simple you may not believe it. While they're a little bit more relaxed with the rules of automation, Twitter has wisely anticipated some shenanigans when it comes to people getting followers for FREE. Unfortunately he's right. That being said, we're marketers who play by the rules, even if we inch right up close to the line. So it's important to know the rules. Tools make life easier. Every good mechanic needs their tools, and so does every good marketer. The beauty of Twitter is that they don't beat you up too bad when you use automation tools to grow your business faster. Other social media sites like Facebook and Instagram have started to render automation tools useless. 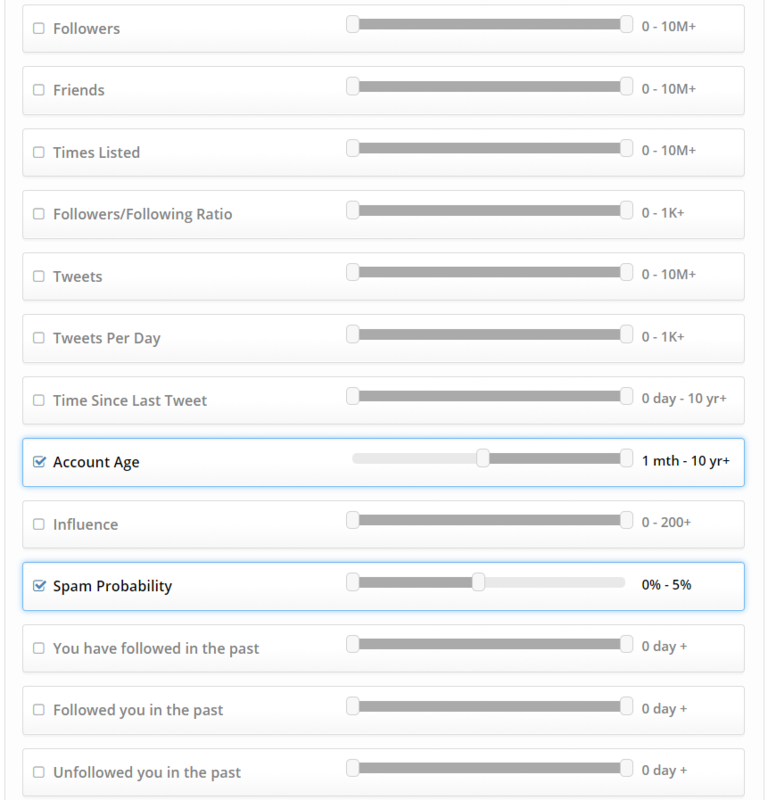 So what's the best tool to automate getting more twitter followers? 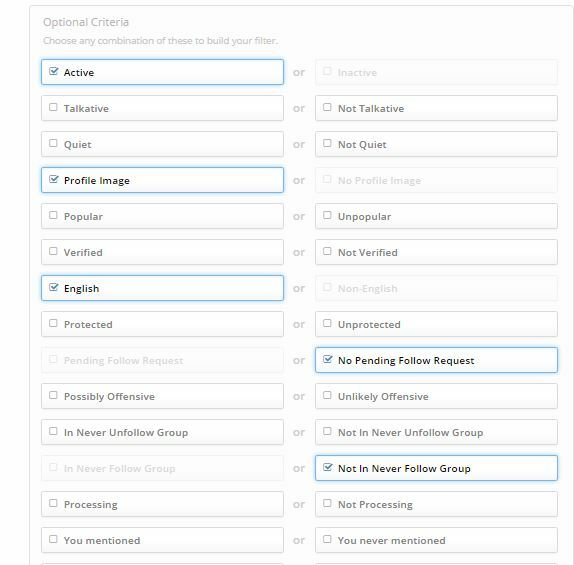 Manage Flitter: What Is It, and How to Get More Twitter Followers With It? Manage Flitter is a web app that's extremely easy to use, and will dramatically speed up your results. As we said above, the best way to get targeted followers (who are going to be interested in what you have) is to simply follow the followers of the leaders in your niche. Of course doing that manually can be a bit of headache. Especially if you've got some criteria that you have to sort through to find the best matching audience. That's where Manage Flitter fits into your business perfectly. This tool helps you do two very critical things when building your audience. Unfollow those that aren't following you back to get rid of the dead wood. Which Version? Free or Paid? So like most great online tools, there's a free version of Manage Flitter, and an upgraded paid version. Which should you use? That all depends on your goals and your budget. In this business you are going to trade one of two things for results. Time, or Money. You are either going to put in more time to get results using free activities and tools, or you are going to drastically cut your time spent with money put towards a tool that will speed things up for you. The good news is that at $12 a month, Manage Flitter is pretty budget friendly. And if you're serious about growing a business, you'll want to hop on the Pro level as quickly as possible. The free version is limiting. And you can only access “Power Mode” with the Pro Version! 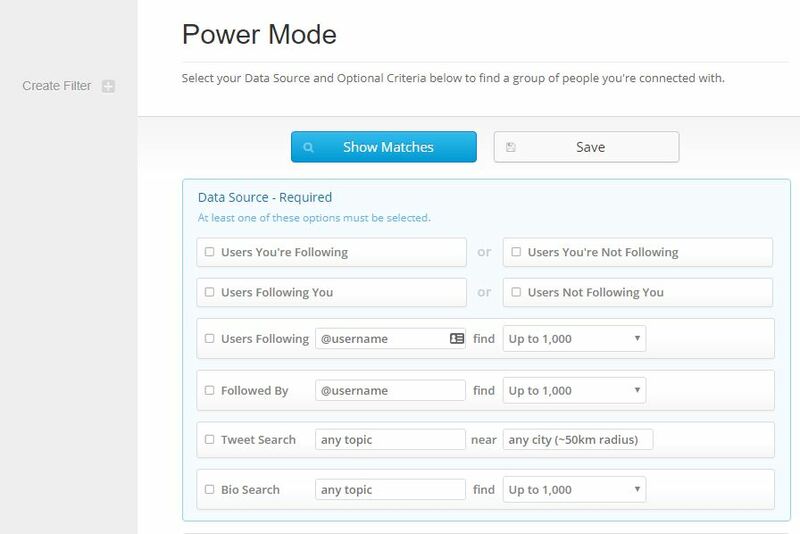 ‘Power Mode' is an aptly named advanced feature of Manage Flitter that lets you target a ‘follow source' (a leader in your niche), and apply filters to find the most targeted audience for YOUR business. Below we're going to give you a complete guide to show you how to get more twitter followers using Manage Flitter's Power Mode. 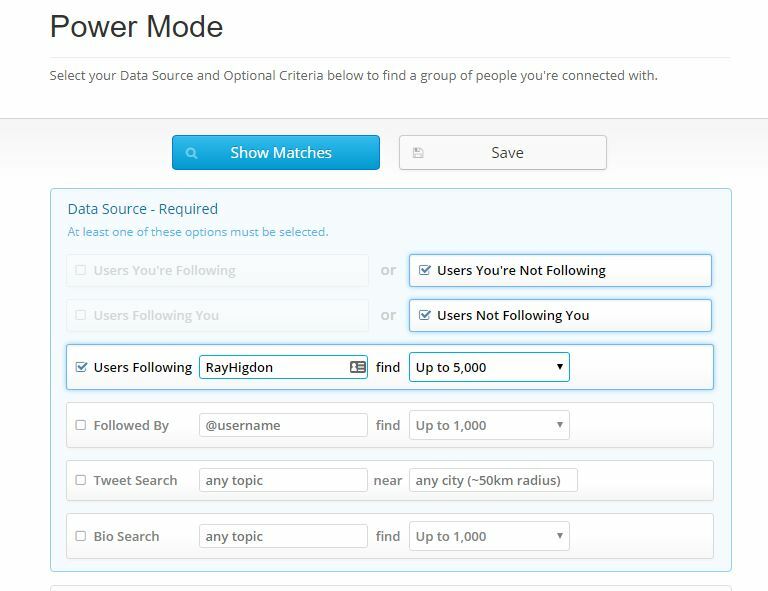 7 Easy Steps to Copy the Followers of an Account With Manage Flitter's Power Mode! Once you log into Manage Flitter's dashboard, click ‘Manage' (first category) on the top menu. In the drop down box, you'll select ‘Power Mode'. This is where we get to be picky about who we follow so we have the most targeted audience for our niche. There are a number of options for you here, but to get started you'll only need to check 3 boxes in this area if you're trying to build a wide audience for your products or opportunity. Check the box for: ‘Users Following'. Add the name of the account who's followers you want to bring to your account and choose ‘Find up to 5000' in the drop down menu! So if we wanted to grab up Ray Higdon's followers for instance, we'd be able to search for Ray Higdon's followers… that you're not already following… and who aren't yet following you. Let's get a bit more picky here so we only follow quality folks, with real accounts, who speak our language, and who aren't going to spam us. Account Age: Set to find accounts at least a month old. SPAM Possibility: Set at no more than 20% to make sure that you're not targeting spammers that will just fill up your account! The next step is simple. You have two options. You can either hit the blue button that says “Show Matches” and that's exactly what it will start doing immediately. Or you can do what Todd & Leah Getts recommend which is to hit “Save” and create a group based on this search criteria. Remember those limits above for getting followers? Well if you're going after a big dog like Ray Higdon who has 65K Twitter followers, there will still be 64K left when you're done. So when you save and name your group, you come right back tomorrow and start again! Otherwise you have to go through all the steps again! QUICK SIDENOTEThe Pro Version of Manage Flitter allows you to save up to 10 groups. Don't worry. If you hit your limit, you can simply delete any group and just re-create it later. No big deal! You can create as many groups as you want, but you can only save 10 of those at a time! Boom! We got to the fun part. It's time to start following the people who show up in the results. You do that by simply clicking the “Follow” button next to each account. Here's the caveat. You do have to do this part manually. There's no catch-all button. However, you can click that mouse pretty darn quick. WARNING Do not follow more than 100 people with rapid fire clicking. This could trigger the little Twitter bots and flag your account. So what you'll want to do instead is go ahead and rapid fire ONLY UP TO 100 at a clip. Then simply give it a break, and come back again a couple minutes later. Rinse and repeat until you have followed your allotted 1000 accounts for the day. The Critical Step of Unfollowing Those Who Don't Follow Back! So when you get Twitter leads for Free with this method, it's important to understand that not everybody will follow you back. In fact depending on a number of factors, many won't! Which means we have to unfollow them! Go to ‘Manage’ – In the drop down menu, click the ‘Unfollow' tab. This will pull up all of those mean folks who didn't follow you back. But don't worry, you get to take your revenge now. You get to unfollow them! Actually we're not doing this to be spiteful. This is simply to clear up space so that Twitter will then allow us to follow more people. What About the People You've Just Followed? 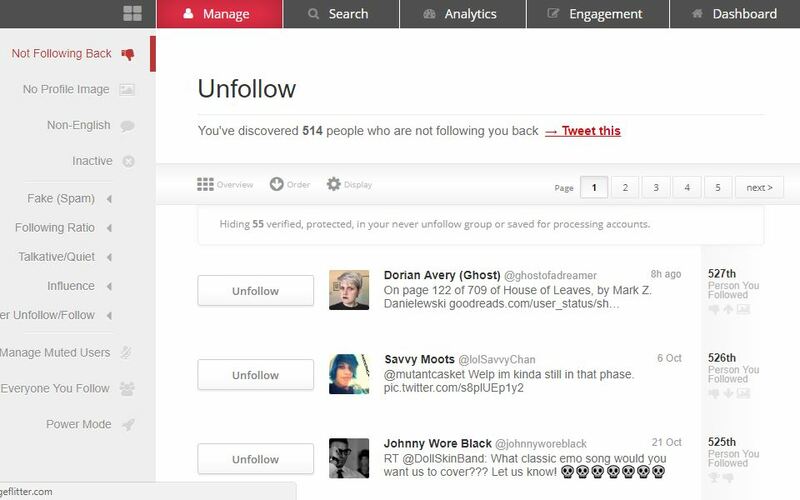 Manage Flitter lets you avoid prematurely unfollowing these people by adding another filter. So that you don't UN-follow the people that you've just followed. Normally you should set this at 3 or 4 days. However if you've just started the process of getting free twitter followers, then you'll want to set it a bit higher until you get the ball rolling. 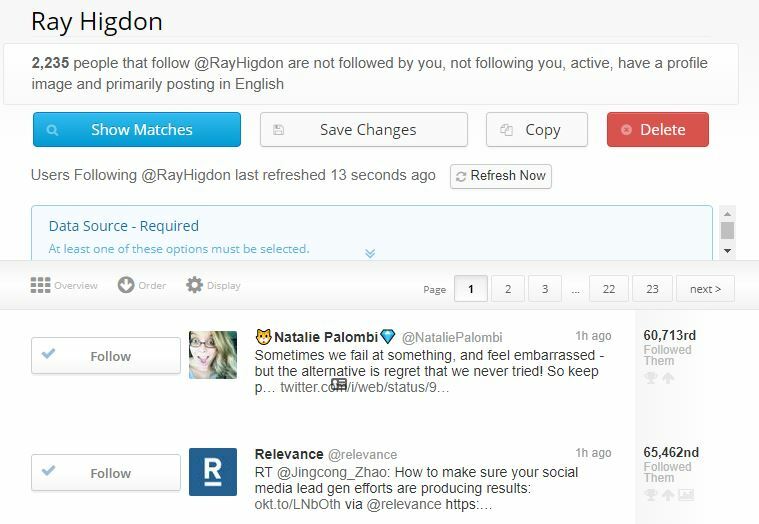 To add these filters simply click the ‘Display Icon' right above your list of followers that looks like a little gear. Extra Tips on How to Get More Twitter Followers! Hashtags are a cool little shortcut for people to get to the info that they want on Twitter. Adding a # sign in front of a word turns it into a targeted keyword rich hashtag. Hashtags can be used in a few different ways. One of the Main Reasons People Use Twitter! The greatest majority of Twitter users go to the site to get NEWS! The Twittersphere is on top of the game when it comes to hunting down, and sharing news on any subject. Which goes for YOUR niche too. For example if you want to find out what's going on in the world of MLM, you can search #MLM in the Twitter search. Now whoever used that as a tag in their post will be displayed. These people are interested in that subject because they're tweeting about it. Which means that if you use #hashtags in your posts, and somebody searches for that keyword, then YOUR content will pop up for them. Which gives them the chance to click to follow you. The best practice for hashtags is to figure out a way to use them in your Twitter posts, within a sentence that you're writing. You can still get attention with your hashtags even if you can't actually fit them within the content of your posts. Want To Get More Twitter Followers? You MUST Engage! Twitter is a social media platform. Which means it pays big to be social and engage with your followers. When you comment on posts, retweet posts that you and your audience will find interesting, or like a post… the other person gets notified. Remember that whole “Law of Reciprocity” thing? That's right. When you engage with your followers, they will engage back. And when they do, followers that aren't yet following you may see it. And decide to follow you as well. You're also not restricted to engaging only with YOUR followers. You can engage with people that haven't followed you yet. When you do, they'll be more likely to follow you. Because you're adding value to them by being responsive. For the above to be true, you increase your odds of a retweet when what you're posting adds value. This after all is attraction marketing at it's finest. People are attracted to value. They want to share valuable content to their audience to earn more goodwill. Will your posts be the one that they share? You now know how to get more twitter followers, both via free strategies as well as with a very valuable and inexpensive tool. By this time tomorrow you could have 100+ new followers on your account. All from using the same simple but insanely effective methods that our L6 leaders Todd & Leah Getts used to get over 50K followers in a very short time. The next step is to just get started! 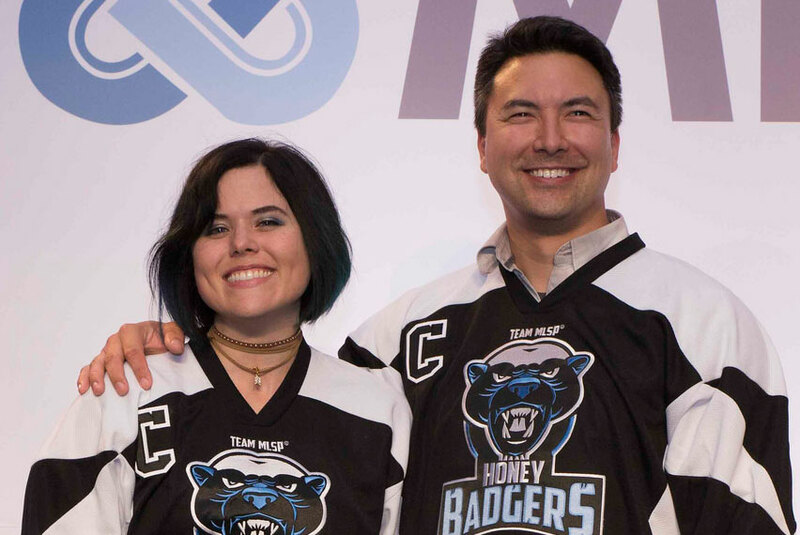 ACKNOWLEDGEMENT: We want to acknowledge and honor our friends and rockstar marketers Todd & Leah Getts for providing the video trainings above so that we could serve YOU, our beloved audience. Congrats to them on all of their success thus far… and we are just getting started! Yes, all still applicable with Manageflitter. They had to get rid of welcome DMs and welcome Tweets like everyone else… but there are ways around that with other tools! I have several business online that need exposure. But I have never used Twitter or actually any Social Media. Just getting started, but I have vested interests in my companies. So I am interested in learning more about the process. You said that the hash tags would help to get more Twitter followers, but sometimes many of the people report that the hashtag (#) with their tweets are not working well as expected. Anyways your article about Twitter is informative. That’s I need. I want more followers on Twitter. For sure I follow your post. Thanks for sharing such great article.